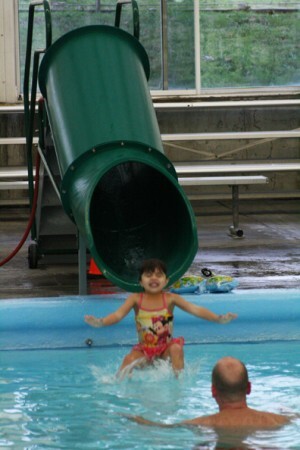 The slide at Eisenschmidt Pool opened November 8, 2010 after much anticipation and a lot of community support. We are very grateful to everyone that helped bring this new feature to our community pool. We hope all ages will enjoy the slide for many years to come. To use the slide swimmers must be able to pass the deep-end swimming test — and be able to catch your breath after the chute shoots you into the water! For the little ones, there’s a starter-slide in the shallow end.